Bizet’s immortal opera, Carmen, is without doubt one of the most well-known and beloved operas in the repertory today, and was the first opera CLO presented more than a decade ago. Set in Seville, the opera deals with the love and jealousy of Don José, who is lured away from his duty as a soldier and his beloved Micaëla by the gypsy factory-girl Carmen, whom he allows to escape from custody. 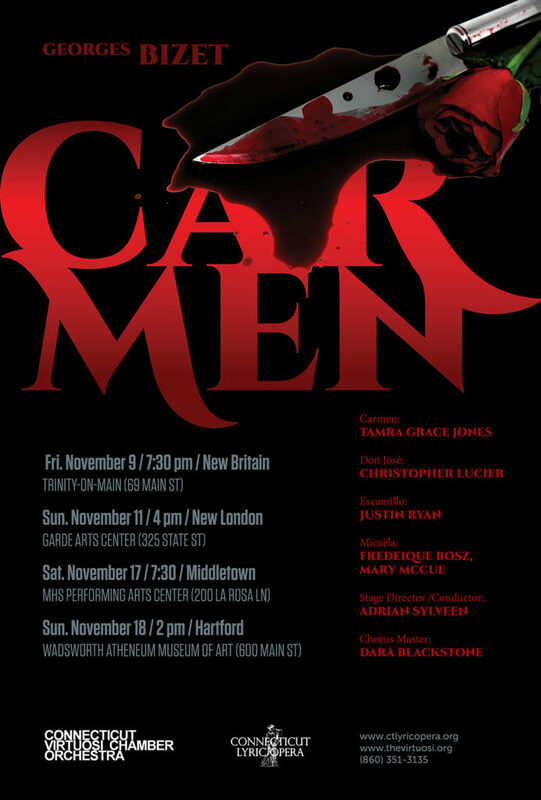 He is later induced to join the smugglers with whom Carmen is associated, but is driven wild by jealousy. This comes to a head when Carmen makes clear her preference for the bull-fighter Escamillo. The last act, outside the bull-ring in Seville, brings Escamillo to the arena, accompanied by Carmen, there stabbed to death by Don José, who has been awaiting her arrival.Opening his 16th season at the helm of CLO’s Artistic Director maestro Adrian Sylveen, will lead the outstanding Connecticut Virtuosi Chamber Orchestra and the production will be fully staged with adult and children’s choruses directed by Chorus Master Dara Blackstone, all with English super-title translations.